On Thursday night, New Belgium Brewing Company hosted an open house at Isis Restaurant in West Asheville to officially introduce themselves to Asheville residents. In addition to New Belgium CEO Kim Jordan and Asheville General Manager Jay Richardson, a number of New Belgium employees, contractors, and community partners were on hand to answer questions and celebrate the beginning of the brewery's participation in the Asheville community. Two things were clear: 1) New Belgium is making a sure-footed, conscientious entry into Asheville, 2) the Asheville community is, by and large, VERY excited to have them here. 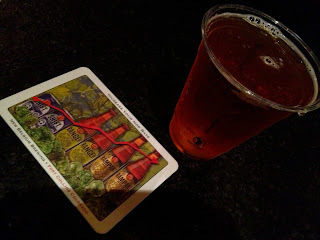 With the new year less than a day away, I want to take a moment to recognize six beer bloggers who have influenced me and my writing over the past year. Whether you are a beer blogger, industrial professional, or casual beer drinker, these are people worth paying attention to in 2013. Each person on the list has a uniquely interesting background, but these writers have a lot in common as well. All are self-starters and completely dedicated to sharing their passion for craft beer. And each person on the list has taken their beer blogging success to a higher level, either by writing for a major publication, working with a professional brewery, or launching their own entrepreneurial endeavor. Every time I walk down the beer aisle I'm confronted with a dilema: Do I really have to buy beer? (Usually yes) Ok, what to get? Of course it's nearly impossible for me not to buy beer when I'm already looking at it, but sometimes I just want to try something new. So what happens if you don't like the whole six-pack? Luckily, some stores will let you break down six-packs, which makes for a less risky investment than buying the whole sixer. So, last time I went grocery shopping, I picked up one of these. The Gift is a winter seasonal from the Crozet, VA, brewery Starr Hill. It is a Hellerbock, a strong lager that's lighter in color than a regular bock. Fun fact: Bocks are believed to have originated in the German town of Einbeck, which sounds a lot like ein bock, German for a billy goat. That's why you'll sometimes find a goat on the label of a bottle of bock. Smell - In the Gift, I found a lot of sweet malt in the aroma, along with some fruity notes, but essentially no hop aroma. Appearance - The color is a light amber and the beer was very clear. The white head faded pretty quickly. Taste - The taste echoes the aroma: lots of sweet, fruity malt, almost no hops. There is a tiny bit of hop bitterness on the finish. Mouthfeel - The Gift is medium-bodied and with a somewhat frothy mouthfeel. Due to the relatively high alcohol content (6.5%), it provides a warming sensation, which is nice in the cold weather. Overall - Starr Hill nails this style right on the head. The Gift actually reminds me a bit of Bass, because there was some definite fruitiness going on. Personally I prefer dark lager, but hey -- try it for yourself! After sampling all three, I couldn't resist the chance to buy a growler of the Battlefield Bock. Having just bought one, I didn't really need another growler, but the smooth coffee and chocolate flavors were right up my alley. I guess I'm just destined for a growler collection. While sampling the brews, a helpful employee gave us some history on Red Oak. What made the biggest impression on me was Red Oak's commitment to doing one thing well. They're not trying to be the next international brewing conglomerate. Of course, because of state regulations Red Oak is only available in North Carolina. See, if they brew more than 25,000 barrels of beer, state law requires that distribution be handed over to another party. So Red Oak is going to hang right around 24,999 barrels a year and distribute their own product, thank you very much. That way, they can make sure their beer gets where it needs to be in the proper condition. I must say I respect Red Oak for sticking to their guns while they battle over the status quo. With a number of breweries (like this one) selling out to the majors, Red Oak's calculated decision to limit production for the sake of their craft is to be appreciated.